A valóságban is népszerű Harry Potterék sportja! Petya | 10. 05. 04. Hogy játsszák amerikai és brit diákok a kviddics néven elhíresült sportot? A cikkből kiderül. Játékszabályok, szószedet, videó! 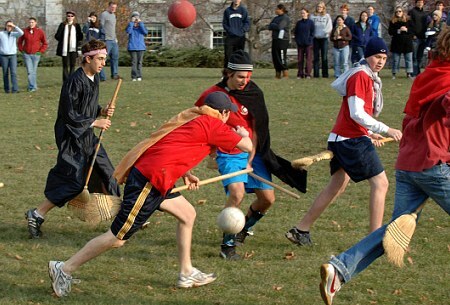 It might look like a cross between a fancy dress party and a handball game, but this is Harry Potter's magical game of Quidditch brought to life by 'muggles'. 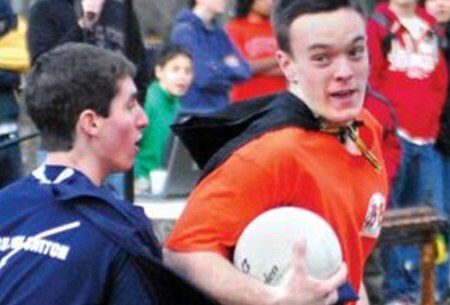 Students have not let gravity get in the way of a good game and are donning capes and straddling broomsticks in a bid to recreate J.K. Rowling's famous sport. While it lacks a magical spark - and the ability to fly around the pitch - the game for muggles (non-magical people) does not appear to be short of fun. It is now so popular that more than 400 university teams in the U.S. are following the rules laid down in the Harry Potter novels. The games sticks to most of JK Rowling's rules including having chasers and the quaffle, or ball. The result is a cross between dodgeball and handball, with a bit of lacrosse thrown in. 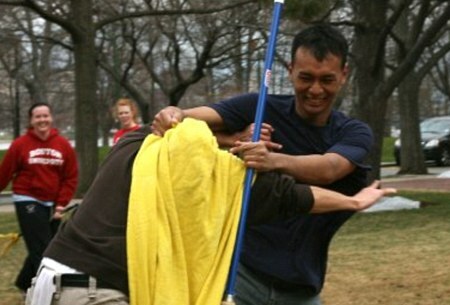 Players must keep to their brooms at all times and are penalised with yellow or red wands for foul play. Instead of flying around of broomsticks like Harry Potter and his best friend Ron Weasley, the teams run around with sticks or brooms between their legs. 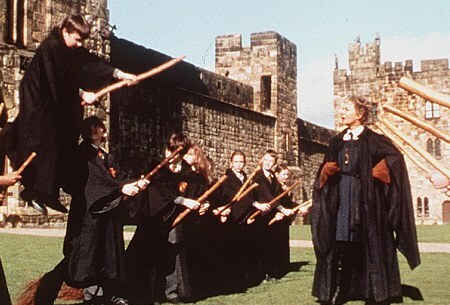 Muggle Quidditch teams have seven players: three chasers, two beaters, a keeper, and a seeker. Chasers score points by throwing a quaffle through one of three hoops, which is worth 10 points, while trying to avoid bludgers, or dodgeballs, that are thrown by beaters. If chasers are hit by a bludger, they must drop the quaffle. The keeper’s job is to protect the three goalposts, while the seeker must capture the snitch — a sock stuffed with a tennis ball tied around a person's waist (typically a cross-country runner or 'fast dude') dressed in gold. Capturing the snitch nets an additional 30 points and ends the game. The team with the most points wins. There is even a Quidditch World Cup. 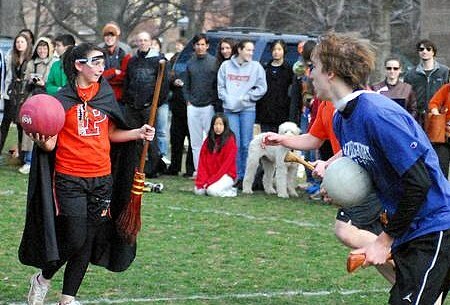 Alex Benepe, the Intercollegiate Quidditch Commissioner, who wears a top hat to games, said: "It started off as a very silly dorm sport and now it's evolving into this national thing." Even Ivy League institutions such as Harvard, Princeton and Yale universities have teams.